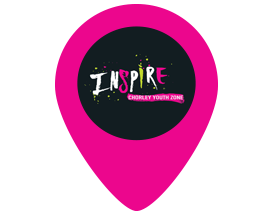 As a brand new charity in Chorley, Inspire Youth Zone offers a chance to make a real difference in the lives of thousands of young people. If you have the energy, drive and enthusiasm to be part of this exciting work coupled with the skills that our roles require, please apply TODAY. 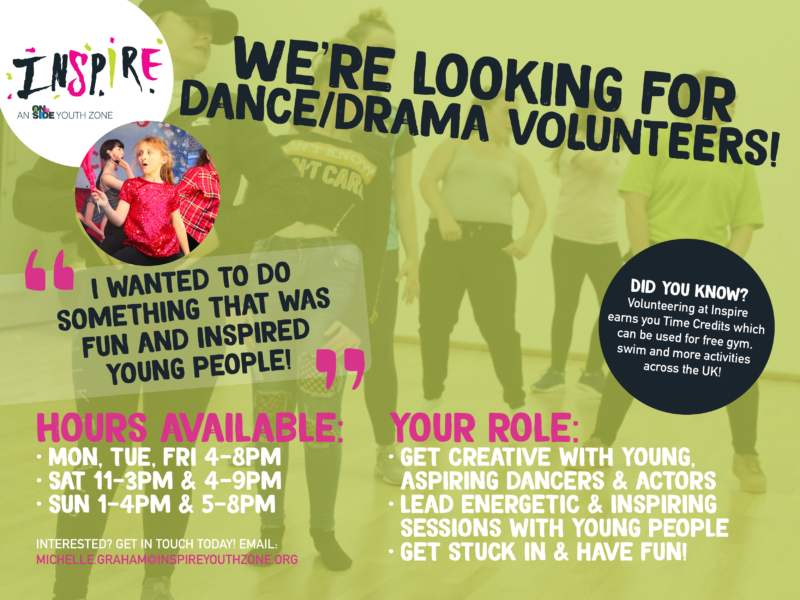 The Role: Inspire Youth Zone, is open to young people 7 days a week, evening and weekends and for some young people, Inspire will be a second home. The café and canteen area is an essential part of the offer to young people and as the Catering and Café Supervisor you will develop, manage and deliver the catering provision at the Youth Zone, ensuring young people have access to inspiring and healthy dishes and the café is warm and welcoming to all. Download the full role profile here. Please also see our Job Applicant Privacy Notice as well as our equality monitoring form. The Role: As an experienced and results driven fundraiser you will be solely responsible for securing £150,000 (minimum) per year from business and personal donations, third party fundraising events, annual grant and trust applications and other fundraising activities. You will proactively manage relationships to encourage longer term support, with a view to securing multi-year patronage and develop strategies and partnerships to strengthen and expand fundraising income. 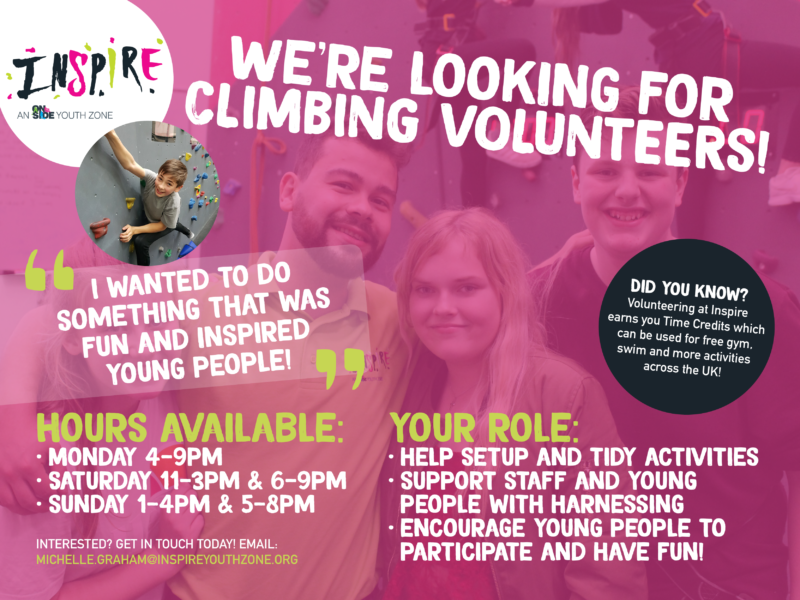 To be responsible for delivering the Inspire Fundraising Strategy to meet the income requirements of Inspire Youth Zone and to ensure a high quality experience for all Inspire Patrons and supporters, embedding their support for the long term. Manage and support the Major Donor Fundraising Manager to ensure the achievement of the Patron and Ambassador Programme, and ensure excellent stewardship and retention of support. 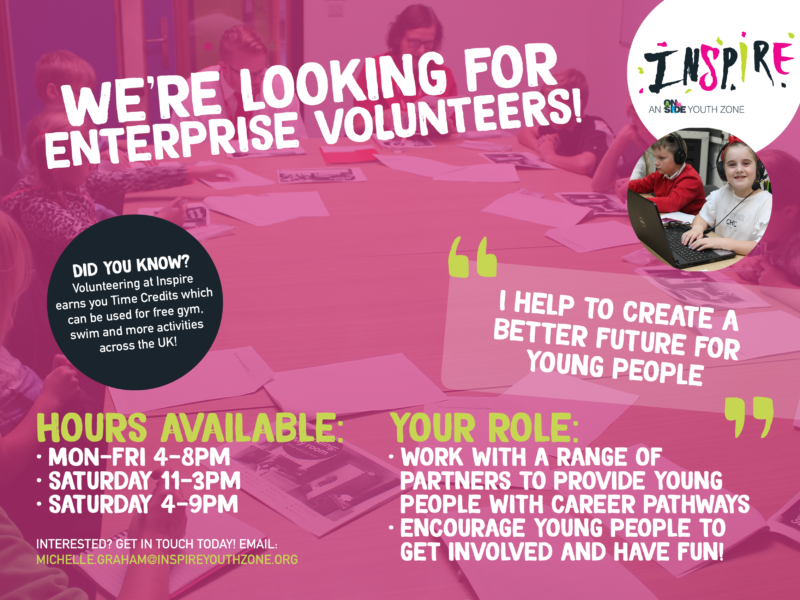 To deliver the Inspire Supporter Strategy in collaboration with the Business and Community Fundraising Manager, ensuring the local business and wider community are engaged with the charity and provide financial support in a variety of ways and at all levels. 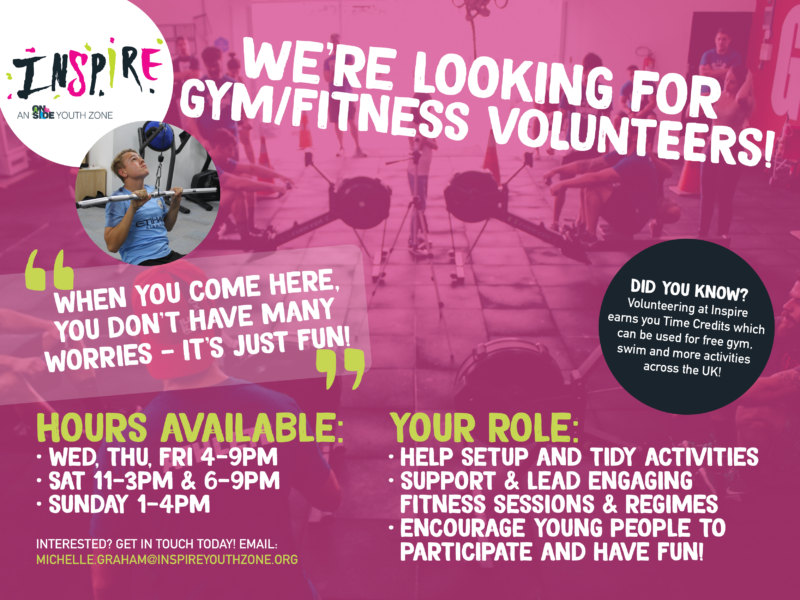 The Role: Sport & Fitness, alongside The Arts and Youth Work is at the heart of Inspire’s offer to young people. 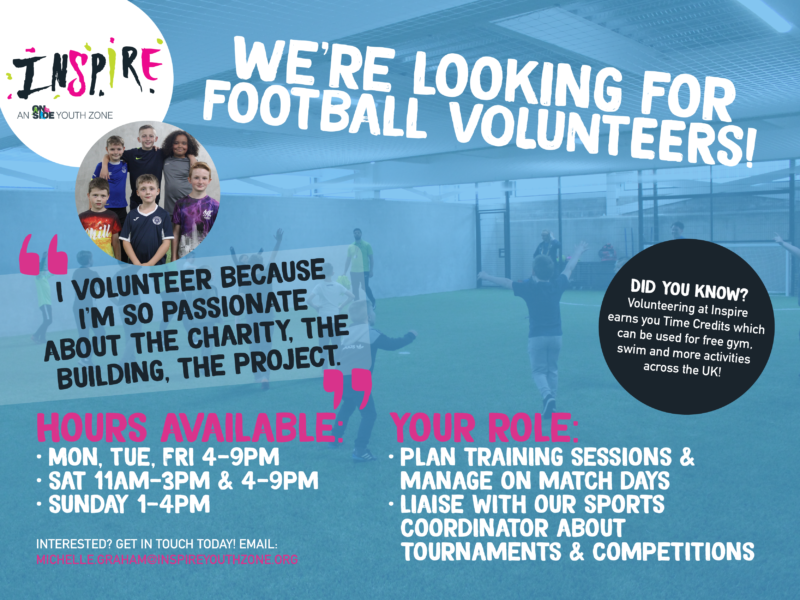 As a member of Inspire’s Sports Team you will be key in ensuring young people have access to an exciting sport programme activity programme people that will be challenging, stimulating, fun, engaging and developmental. 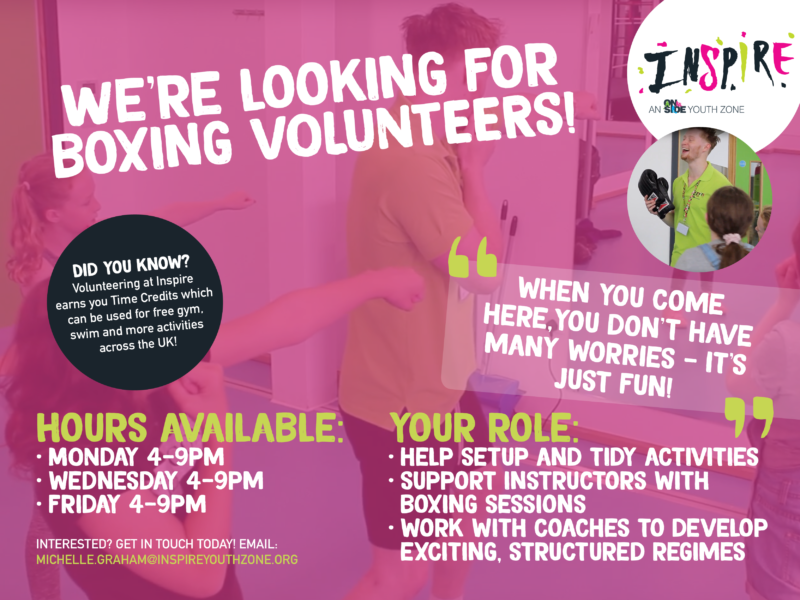 You will be involved in teaching the fundamentals of a single sport or range of sports activities to young people as well as facilitate taster sessions, competitions and challengers, which engagement, skills and fitness levels. 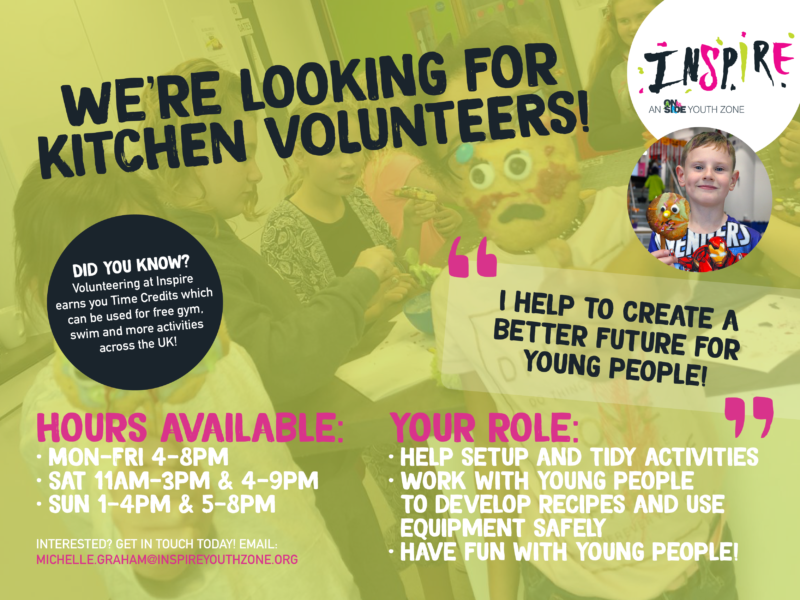 The Role: A vital front of house role, the reception is the first point on contact for Youth Zone members and their parents. 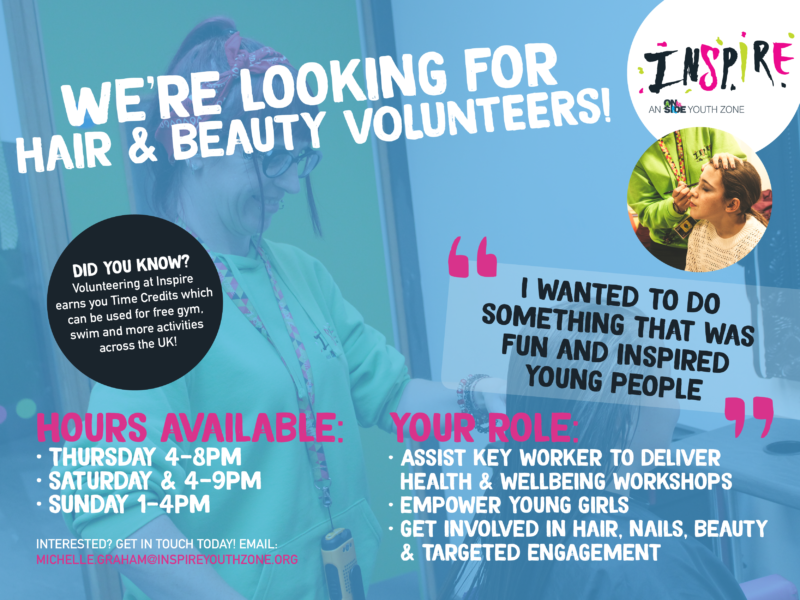 Without a welcoming and professional team who are also positive about young people the Youth Zone would not function. 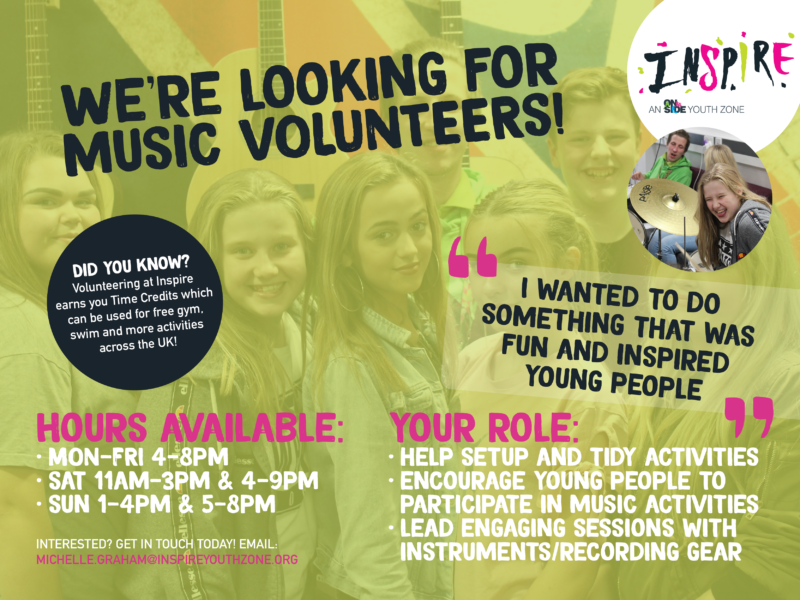 Working during the Youth Zone sessions you are responsible first of all for giving every young person a warm welcome into Inspire. You will be responsible for the reception area ensuring young people enter the session smoothly, processing new members, directing phone calls and enquiries, maintaining the membership database efficiently and carrying out regular communication. Scroll down to see our available volunteering opportunities. 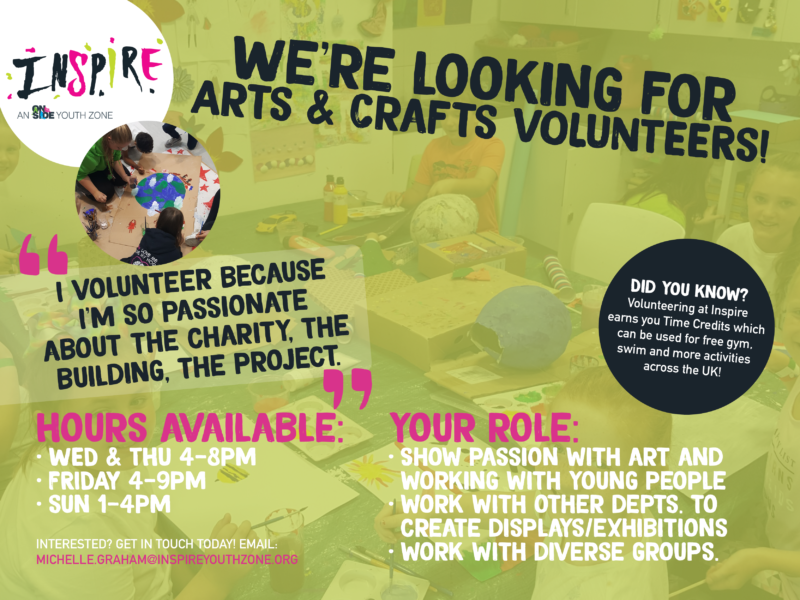 If you would like to express an interest in volunteering at Inspire, please complete the contact form below and a member of our team will be in touch with you shortly. The Role: We are looking for volunteers to make a difference to the lives of children and young people through coaching basketball. Our newly formed and talented team are looking for a coach to take them to the next level. 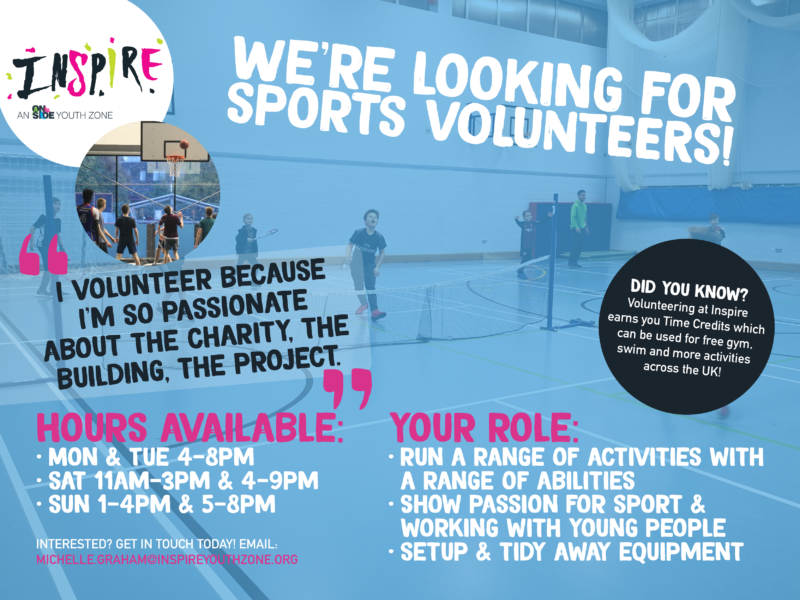 Sport is an enormous part of what we do at Inspire and as a volunteer here you will feel pride in what you and the young people you work with are achieving. Click here to download the full role profile.